Google fans hope the Internet search leader’s proposed augmented reality glasses are more reality than hype, even if history shows companies are more often releasing videos touting technology that may take years to actually come to life. Google released a concept video, titled "Project Glass: One day...," on April 4 in which a man only using his voice and other inputs does things commonly handled by smartphones, such as scheduling meetings, taking pictures, checking the weather, getting directions, and placing a video call. The difference is instead of having to hold a device in your hand, the data you need hovers in your field of view. Adding to the hubbub, co-founder Sergey Brin was spotted the next day wearing a prototype of the glasses at a San Francisco social event. In response to the publicity, people seem to be pumped up about the prospect of AR glasses anyone can wear; Google’s YouTube video already has had nearly 9 million views with most of them liking what they see. Yet in spite of the hype and the fact that in February, The New York Times reported that Google was planning to release such high-tech glasses later this year, not everybody is holding their breath for an actual product like the one in the video. According to Wired, at least a couple of experts say the technology Google is showing off can’t possibly deliver what the concept video depicted. “In one simple fake video, Google has created a level of over-hype and over-expectation that their hardware cannot possibly live up to,” said Blair MacIntyre, director of the Augmented Environments Lab at Georgia Tech. At right, Google co-founder Sergey Brin wearing prototype glasses. 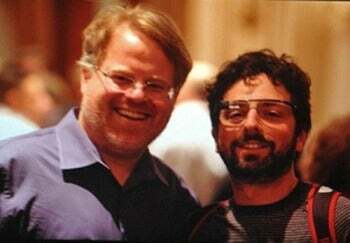 Image courtesy of Robert Scoble, at left. He also said that even if Google was able to overcome technical barriers, you shouldn’t expect to see real AR glasses on the market for at least two years. That’s because of limitations with what current head-up displays can do and the fact that actual augmented reality in a display would necessitate additional eye-reading hardware, allowing for dynamic focus. Another concern is that creating a transparent display that is easily viewable both inside and outside is tricky. 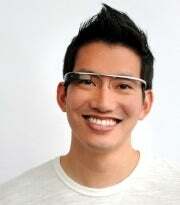 Defying the critics, consumers remain optimistic and hopeful that Google Glasses are coming soon. Microsoft and Corning are examples of just two companies known for cool futuristic concept videos that make consumers drool. And while technophiles may cherish the idea of an incessant stream of data floating in front of their eyeballs at all times, certainly there are others who recoil at the thought. For one thing, how can you interact authentically with the world around you when everywhere you look you’re prompted to check-in to Google+, reminded that you have a meeting in 30 minutes, or fed instructions about which path is the best walking route to take? How about a little serendipity? For example, in Google’s concept video the man wearing the glasses meets a friend in a bookstore by following the most direct walking path to where his buddy had checked in. Fine, but what if the man directed by the glasses missed out on a couple of interesting books he might have stumbled upon if he had taken a more circumventive and undirected route? Not only that, some people, such as PCWorld’s Ed Oswald have pointed out some concerns with all that data being fed into your line of vision. Distracted driving as it relates to making phone calls and texting pales in comparison with what could happen when people use AR glasses in their everyday lives. Even so, the technology is cool. But some people already bogged down with too much information will gladly wait to see Google’s Glasses come to fruition.